Amidst the lingering proclamation of the winner and loser of Lepcha para-teachers, the Gorkha JanMukti Morcha today formed a sub-divisional level committee of the Lepchas naming it as ‘Janmukti Lepcha Organization’ (JLO) in the presence of resources personalities of different departments. More than 200 Lepchas were present in the meeting called in Morcha Party Office this afternoon. Dawa Lepcha, the sabasat of _ number constituency addressing the Medias said that the committee formed today is in an Ad-hoc basis as it is formed in the absence of the GTA Chief, Bimal Gurung, ‘we have just considered this as an Ad-hoc committee and we are yet to get an approval of our chief as he is out of station, once he comes back, we will call a meeting with him along with these people’ said Dawa Lepcha adding that J.L.O is an frontal organization of GJM for now. 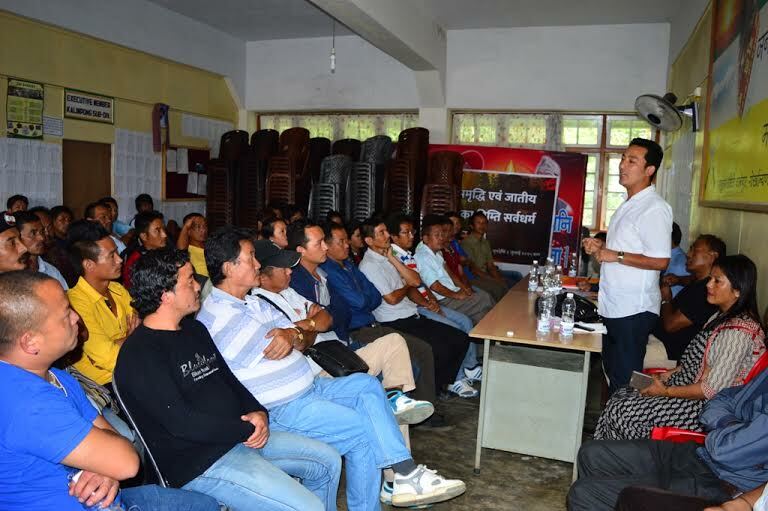 In the meeting attended by 200 plus Lepchas, it was discussed that the Lepchas of the hills are living in confusions as the hills are under the supervision of GTA and all the facilities comes through GTA, where in contrary, Lepchas are hindered from enjoying the facilities as they wholly supports the opposition party. Moreover, the known Mamata Government has no official role to play in the hills according to the GTA agreement, which is the reason behind the question of existence which the Lepchas living within the boundary of GTA ask to them-selves. ‘After discussing about the existence of the Lepchas in the hills, we came in the conclusion to make a good relation with the regional party with a thought that unless we get merged with the party in power, we will see no development’ said Dawa Lepcha, on behalf of other Lepchas. However, the Lepchas that flocked from Lolay, Mirik, Santuk, Paiyu, Pedong, Kashyong, Gitdabling and Bongbusty to attend today’s meeting indirectly gestures a hostile challenge to MLLDP and ILTA. It was further known that half of the population of Lepchas living in the outskirts are deprived from many things like proper roads, sufficient drinking water and electricity where in the other hand, the monitoring MLLDP directed by the Bengal government has no sufficient fund to look after every trivial matter that the Lepchas face, ‘MLLDP is just an organization registered under the society act, they cannot act without the approval of the GTA’ said Dawa adding that Lepchas were always a backward tribe now the financial condition of MLLDP has made them display empty vessels. Lepcha, who is now the president of the newly formed organization goes hard hitting to ILTA saying that the Indigenous Lepcha Tribal Association has reached the verge of name alteration to Indigenous Lepcha ‘Trinamool’ Association as they are actively involved in political matters creating insecurities to the overall mass of the Lepchas. Meanwhile, the sabhasad added that they might meet the Lepchas of Darjeeling and Kurseong and work effectively by forming a larger unit till the time the GTA Chief return. The organization has set 25 approximate executive bodies where Dawa Lepcha is the President, Ruben Lepcha-Vice President, Emmanuel Lepcha- secretary and Daniel Lepcha- the Working President.